We're super excited about our first two Guest Artists for 2016... Kelly Kilmer and Laurie Mika. Kelly will be with us Memorial Weekend (Friday, May 27 - Sunday, May 29) for five great workshops with a focus on fabulous. Everyone who took her workshops during her last visit stated that they were "among the best" they had ever taken. 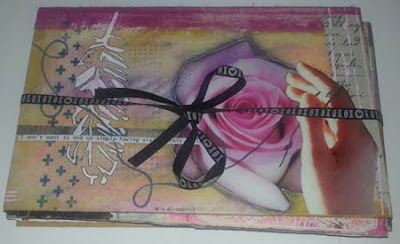 The techniques Kelly employs in her art journals and collages will help you take your journals to the next level. These photos are from her Painted Connections project (Friday's class). Laurie Mika, well known in the polymer clay world, brings her special talents to share on June 18-19. She'll guide you in successful creating with clay and your finished pieces will make you proud! 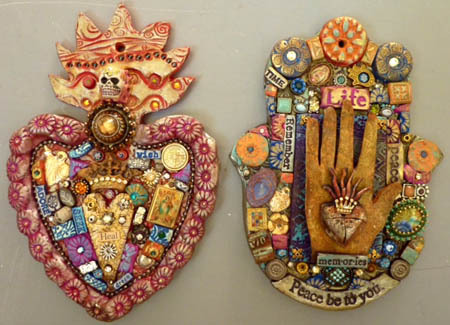 This photo features projects from her Handmade Hamsas & Hearts workshop. Plans for a Royal Yard Sale are in the works, so look forward to details on this fun event, as well as additional workshops we're working on. We are pleased to announce a fabulous workshop in the unique ManneqART style. This is a great opportunity for all of our Royal Customers who are intrigued and interested in learning about wearable art. A renowned wearable art professional will lead this workshop, with participation by clothing designer Lee Anderson, as well as our very own Queen Patricia (you can applaud here or curtsy if you must). Your creation may be eligible to compete in the annual ManneqART competition, although that is certainly not required. The Queen as well as several of our customers have participated in the competition, and can provide you additional information about the competition should you decide to enter. Feel free to call the shoppe and ask questions! Below is a copy of the original brochure about this workshop opportunity. JRA members and non-members: please join us on Saturday, February 20, 2016 from 10 a.m. to 4:30 p.m. for a day of fun and creation! Design and build your own unique wearable sculpture with help from the experts at ManneqART. Robert Reed, the creator of OMGEODE! DIAMOND IN THE FLUFF, NOWHERE TO HIDE and other award winning "sculptures on the human form" will lead attendees in the design and creation of your own wearable artwork. ManneqART's founder and clothing designer, Lee Andersen, will also be participating. To see other art works by Robert Reed and other wearable artists, visit the ManneqART Gallery at www.manneqart.org. You may work individually or as a team, the only requirement is to have fun, play and create. A cache of material will be provided but also feel free to bring your own materials to play with. We recommend you bring a bra to build onto. (guys: a bra can be purchased at walmart for $5). We also recommend bringing TWO of any item (from the dollar store?) from your attic (ideally with holes to allow them to be attached to the bra easily). To register online, visit the ManneqArt website. Call The Queen's Ink for more information and/or for offline registration.